Jadam Express, welcome aboard! BusOnlineTicket.com is very pleased that Jadam Express is joining our team to provide online booking service for their bus tickets. Now, you can book Jadam Express bus ticket online in a few minutes without any hassle! Jadam Express is a popular express bus company offering bus services within Peninsular Malaysia. The bus company’s headquarter office is based in Alor Setar, Kedah. Jadam Express’ buses are fully equipped with air conditioners, spacious legroom and reclining seats to ensure their customers have a pleasant journey. A single-way ticket price for the bus from Johor Bahru to Kulim starts from RM65.00 while the bus from Kulim to Johor Bahru starts from RM70.00. Please note that Jadam Express also offers bus from Kulim to Ipoh at an affordable price from RM28.00. 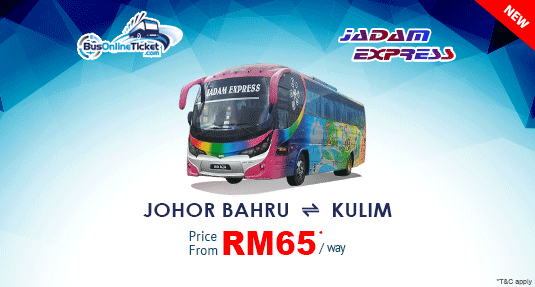 Everyone can now book Jadam Express bus ticket at BusOnlineTicket.com and travel easily between Johor Bahru and Kulim. Booking bus ticket through BusOnlineTicket.com is an effortless and secure way to book your bus ticket online. BusOnlineTicket.com allows users to check bus tickets availability, book your preferred bus ticket and pay it online.